The English might not be the best cooks in the world, but they sure produce the best writers. Dickens. Tolkien. Austen. Rowling. Lewis. And now another: Philip Pullman. I’ve just finished listening to Pullman’s The Subtle Knife, Book Two of the His Dark Materials trilogy. If you’ve never heard much of Pullman, you will soon. The first book of the series, The Golden Compass, is being made into a film by New Line Cinema, those guys who gave us a little trio of obscure films entitled The Lord of the Rings. The idea, I’m hoping, is that New Line will adapt the whole Dark Materials trilogy into three seperate films. Incidentally, it was the announcement of the films that attracted me to the books; I read about the deal in Variety, the daily trade journal for Hollywood. Pullman has already made a splash in Britain, winning a slew of awards for the trilogy, including one Carnegie Medal and the Whitbred Book of the Year Award in 2002, the first children’s book to ever win the prize. Of course, I wouldn’t call these children’s books for the same reason I don’t call the Harry Potter books children’s books. As far as I can tell, the only distinction between young-adult fiction and adult fiction is the age of the hero. If the hero is a child, then the publishing world considers it young adult. If the hero is an adult, it’s adult fiction. Orson Scott Card’s novel Ender’s Game is sometimes wrongfully categorized as young-adult fiction for this reason. I think it silly. But that’s neither here nor there. The point is: These books are fascinating. Pullman has an imagination as rich as Rowling’s and is a master of prose to boot. The man can write. And I mean beautifully. But not for beauty’s sake. This is knuckle-down, teeth bared action and suspense. No whimsical literary bouts of simile or metaphor for academic’s sake. This is a full-out page turner, both enchanting and gut-wrenching at the same time. The story revolves around a young girl (twelve, I think) named Lyra Belacqua, whose world is starkly different to and yet in other ways very similar to our own. In Lyra’s world, all humans have a demon, which is a talking animal that is part of the human it belongs to, just as much as our hands are part of our bodies. Except the demon is not attached to humans. It moves and thinks independently of its master. And yet they are one. When the human dies, the demon dies. And vice versa. Children’s demons change form at will —from a bobcat to a moth to a German Shepherd — always to assist the human it belongs to. If Lyra is in danger, her demon, Pantalaimon, will become a leopard to protect her. Or a wolf hound. Or a fox. And if the demon needs to conceal itself, it will become a grasshopper and stay hidden in Lyra’s pocket. But demons are only one of the magical creatures found in the trilogy. It’s full of a world . . . well, actually multiple worlds, so intriguing and full of fantasy that one begins to hope such places exist. I didn’t read the first two books, rather I listened to them on my iPod, via the CDs at the library. Much like the Lord of the Rings cast recording done several years ago by the BBC, the Dark Materials trilogy features a full cast of stellar performers, who breathe life and suspense into the story, as well as a narrator, whom I was floored to find out was none other than Philip Pullman himself. He does amazingly well, giving each narration just the performance it needs, without detaching the listener from the characters and the action around them. It’s very unobtrusive. In fact, I think I recommend the recording more than the books themselves simply because there’s gut there I’m not sure I would have find in the text. Either way, you must get your hands on it. I myself can’t wait to listen to Book Three. A word of caution: His Dark Materials isn’t for everyone. Pullman has been called the opponent of C.S. Lewis, having spoken out against the former author’s trumpeting of Christian ideals. 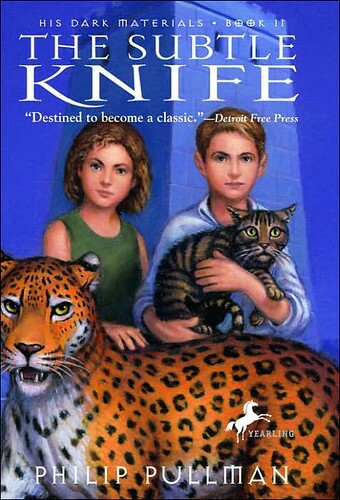 In fact, some even call His Dark Materials a rebuttal to The Chronicles of Narnia. You see, in Pullman’s trilogy, the villain — the most dishonest, cruel, horrific organization in all the worlds that exist — is “The Church.” It’s not the most fair of labels, but it doesn’t bother me. This is fiction. Pullman is no advocate for evil, although some Christian groups may label him so. In truth, Pullman isn’t attacking Christianity, he’s attacking all religions that oppress. Some apparently don’t see the distinction. I, for one, love the series and find that my faith has not diminished as a result of reading it . . . or rather, listening to it.